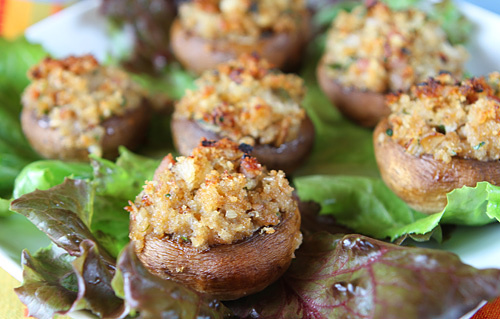 I have made stuffed mushrooms in many different ways, but I like the simple breadcrumb topping best. At times though, I find the mushrooms are just a bit dry when prepared this way so I decided to remedy this by putting a little creamy seasoned cheese into the cap before I add the crumb mixture. This method works really well and the cheese is a nice surprise when you bite into the mushroom. Mushrooms are low in fat, high in B vitamins as well as fiber and protein. The filling in this recipe contains much less fat than traditional recipes. 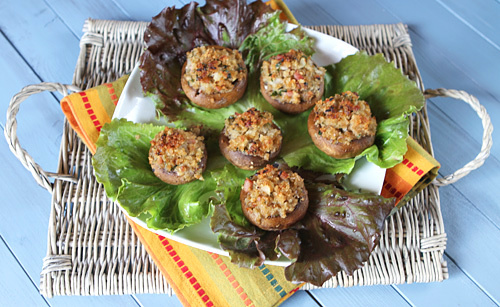 Stuffed mushrooms are a great addition to any appetizer platter when entertaining. Wipe the mushrooms clean and carefully pop out the stems. Finely chop 1/2 Cup of the mushroom stems. In a frying pan, heat the olive oil and then cook the chopped mushrooms, onion, and pancetta on medium heat until the vegetables are tender and the pancetta is cooked. Add the garlic and cook another minute or two. Remove from the heat and then add the breadcrumbs, parsley, cheese, and wine. Place the mushroom caps in a baking dish and place a spoonful of creamy cheese into each. Top the cheese with the breadcrumb mixture, pushing it in gently with your finger tips. Bake the mushrooms in the preheated oven for about 25 minutes or until the mushrooms are tender when pierced with a fork and the topping is golden brown.